Surdry carefully selects all hardware and software from top class international brands to provide high quality components with spare parts and service close to our customers worldwide. 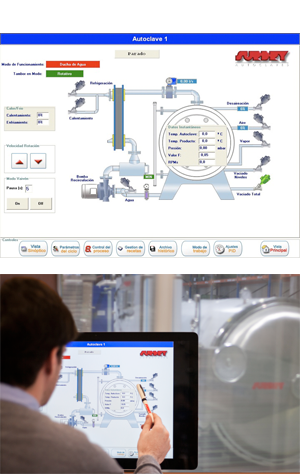 PLC control logic and HMI and computer software are designed by Surdry control experts to ensure the maximum level of process safety, reliability and repeatability. GMP, HACCP and FDA food safety guidelines and regulations are strictly followed. The basic control system package allows fully automatic process operation with PLC and color touch screen HMI. A video recorder is connected to an independent temperature measuring instrument for independent reading and value cross check. As part of the basic package, Surdry includes a high accuracy and reliability electronic thermometer, battery operated for periodical external calibration. This instrument is the “master thermometer” as the one against which the retort control temperature and the recorder temperature must be checked and calibrated. Designated in the USA as ATID (Alternative Temperature Indicating Device), it is approved by the FDA to replace dangerous mercury-in-glass thermometers. Fully developed by Surdry control engineers, SteriNet is the Surdry SCADA system to provide process online and real time remote monitoring, process recipe management, electronic record keeping and report printing, alarm logs, etc. in a computer software system designed in the most visual and user friendly way. The SteriPro software application allows full operation (start-stop, manual intervention, etc.) of a number of multiple retorts from a PC based HMI placed in a control desk or in an electric cabinet placed remotely in a control room. SteriPro includes all system utilities of SteriNet and can be extended to other desktop computers via Ethernet connection. The user permits are limited and protected in multiple levels by individual password.